I always get a little misty eyed when I put up a post letting y'all know that "Such-in-so Smithee Movie Actor has passed away" but I've never had to write one for an actual Smitheeite I've come to know and like. It's a hell of a lot harder to do. 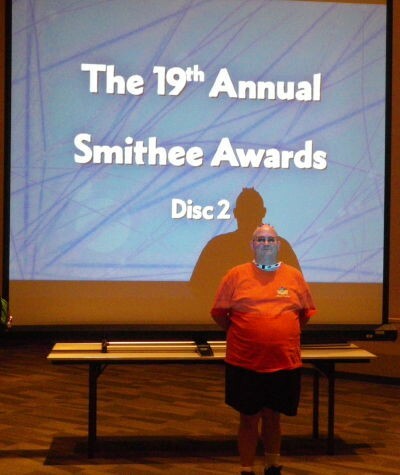 Ty was our "Official Smithee Stalker;" most often securing that front row seat (right by the projector) at the Origins Smithee show but he made it up to the Ann Arbor show at least once and several times he was one of the few, the proud, the U-Con Mini-Smithee test audience. 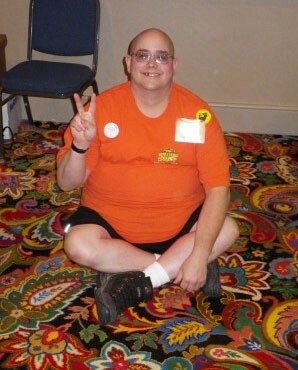 Most of you knew him as "That fella who glues 4-sider dice on his head," while we also knew him as "a giant orange ball of sunshine." 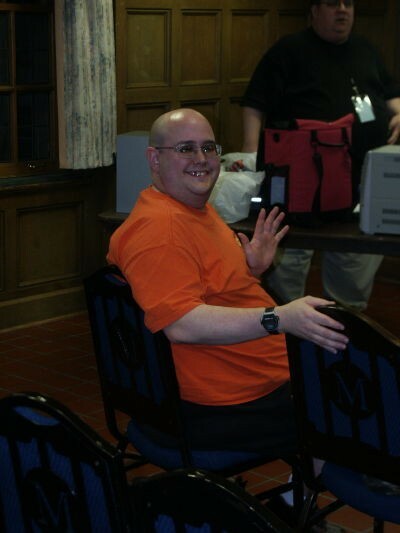 In part that's because we gave him a bright orange Official Smithee Stalker shirt but mostly it was the cheerful face he put forward despite the adversity in his life. 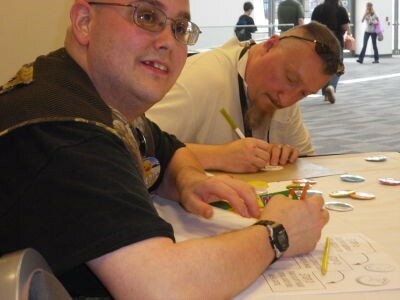 Not even the eye searing mutant paisley carpet from U-Con 2011 could hold a candle to Ty. We lost our bright yellow extension cord thing-it on that carpet but not Ty. I'm not sure I've ever seen bad movies bring out the glee in anyone the way they did in Ty. 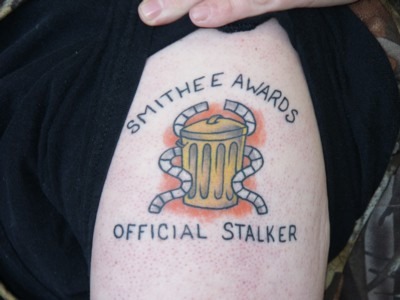 He mentioned to me once that he thought of the Smith-ka-teers as his 'Bad Movie Family' and even had the Smithee logo tattooed on his arm. For our part, seeing him sitting in the audience put a smile on each of our faces every year and I know I looked forward to seeing what message was going to show up painted on his head. My favorite was "Save Me;" we had a whole contextual debate about the semantics of that message. The Smithees aren't going to be as bright or vibrant this year without the presence of our Official Stalker. We will miss you sir; Godspeed. This is Tys sister. Ty passed away from Diabitic Ketoacidosis on the 27th of Febuary. Well that is sad, indeed. :( I don't think I ever met Stalker Ty, but I've heard plenty about him. Did he die recently, and how did you hear about it? I feel like I know him even though we never met. I believe in a world to come and I also believe that world has bad movies AND you get to watch them God. Godspeed my good man.